As growing media specialists we are at the forefront of innovation and performance. Our comprehensive range has everything you need to grow, whether you are looking for peat based, peat reduced or peat free growing media. We also produce specialist mixes to your exact specifications, incorporating additives, plant protection products and fertilisers. All growing media can be supplied in bags, big bales, IBCs or loose bulk. Our product range includes perlite, vermiculite and hydroleca. We also offer a superb choice of fertilisers such as Sincrocell NextGEN controlled release fertiliser, water soluble fertilisers, Sincron+ top dressing, a range of barks and pot topper. 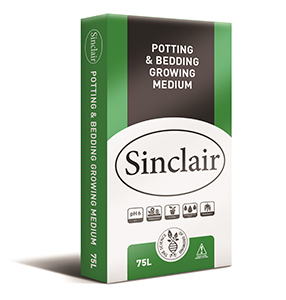 Sinclair are part of the Westland family, one of the leading and fastest growing horticultural companies in the UK. In 2015 we were acquired by Westland Horticulture and as a result we have gone from strength to strength. Investment on site has included a new bark production plant, the latest innovative production machinery and investment in a large technical team responsible for continuous research and development to ensure we provide you with the most technologically advanced product for your needs. Innovation is key. We have multiple production sites ensuring a continuous supply of product throughout the UK. In addition, we have a state of the art fertiliser granulation plant in Dungannon where we produce most of our own fertilisers. Our expertise is also strengthened by our partnership with Reading University who conduct ongoing product trials ensuring our product performance is second to none. We also have a strong sales force covering the whole of the UK and our products are also sold through distributors ensuring maximum coverage.